Today I wanted to tell you a bit more about what I do when I’m not looking for monkey puzzle trees, or cataloguing your finds – and how I spend the majority of my working life. Although whenever I am out working I am of course looking for monkey puzzle trees! Here’s my day. 8.30am. 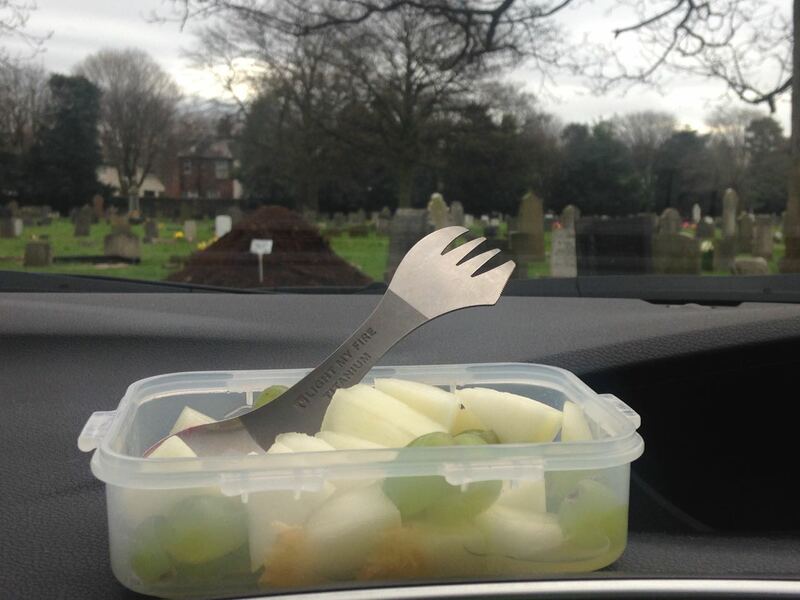 Breakfast in my car in Anfield Cemetery. Seems strange? Well not for me as I often spend parts of my day in places that are close to crematoria, because I work in the funeral industry, as a funeral celebrant. I create and deliver individual funeral services for families and friends. It is a huge privilege. Today I have three services in three different crematoria. This is my trusty A to Z which is falling apart but is my navigation tool of choice. My regular crematoria are marked L (Landican on the Wirral), S (Springwood, south Liverpool), A (Anfield, north Liverpool), T (Thornton), S (Southport) and H (St Helens). Driving along Queens Drive this morning I notice that the blossom on the weeping trees is beginning and remember how much I want to tell my friend Rachel every year when I see spring start to arrive. She died in February 2012, I miss her. These strange small trees are really unremarkable for the rest of the year, but for a brief period are in blossom, and are lovely. Do look out for them if you are in Liverpool. Image from Google – Queens Drive, April 2015, near Larkhill Place. I am then up at Anfield Cemetery in good time for my service and take some quiet time here. I love it here. The works to Liverpool’s ground are visible from here (on left photo), and Glendales are always working here doing routine tasks, today mowing grass and emptying bins. It is a much loved place. And much loved by me too. I’m in Anfield crematorium next. Anfield crematorium is the fourth oldest crematorium in the country, it was opened in 1896. All is well. And then it’s time to go further north to Thornton. Passing Everton’s ground, up to Aintree past all the many and various signs that tell us that The Grand National will soon be upon us, and then to my favourite café in Netherton. Rushdens is a straightforward and delightful place, and I have spent much time here before or after services at Thornton. There’s an old barn in the car park and often there is a ‘flight’ of doves here. Time to go to Thornton crematorium. There is a monkey puzzle tree on the main drive. Already on my Monkey Map. I haven’t come along it today, but getting to here for me is much easier since the new A5758 – Broom’s Cross Road – opened. You can see the new road in the distance from the Garden of Rest (which is what this is called). Thornton crematorium was opened in 1963. Wonder if the monkey puzzle tree was planted then? If so, we’re the same age. I park in my usual place. The previous funeral is still in. I wait. Until it is time for me to put on my funeral boots and vestments (as I call my funeral outfit, I have special clothes and boots I only wear for funerals, that is their sole purpose). I wait in the vestry, pressing my hands on the radiator, it is very windy and cold. All is well. After this service I’m off to St Helens. I navigate my way to Fleet Lane, the far side of St Helens, as the very nice manager of the Co-operative store there is displaying my notice which is a request for witnesses to the van that put a rather nice ‘bruise’ on my car last week (and didn’t stop, although I did get the registration and am pursuing things). I buy my lunch here and am called ‘cocker’ by the assistant when she thanks me, but everyone is. Ah yes, I am in St Helens. On my way back to the crematorium, I spot this! And then arrive at St Helens crematorium. And at St Helens they also have a monkey puzzle. It’s nice to see that this tree is doing well – quite a lot bigger since I first photographed it two years ago. Time for lunch in the car. I get a hot drink from Starbucks, but find some places like that too noisy to spend pre-funeral time in, I need this quiet time alone. Also time for some make-up too. My lovely car serves as a multi-purpose very good dining place, mirror and office. I am especially pleased with the nice mirror and light on my car’s sun visor, in fact it was one of the things that made me want it! It rains. I read through my service. The sun comes out. This is the rather odd windy tunnel that is the entrance to the crematorium chapel, which is where I will greet the hearse, and lead the service into chapel. And it has these massive pillar and huge wooden door which rolls open, like a ship. I wait in the Clergy Room, out of the wind. Until chapel is free and I can go in and see the chapel attendant. I love the stained glass in this chapel. It was opened in 1962. And there is more stained glass above the central seating in a tower, so this is like a cathedral space. After my service, all is well. I sit for a while in my car, observing the stillness of the place, the final service of the day is now in chapel. The chapel attendant comes out and is locking up the gates around the crematorium building. I’ve seen other chapel attendants at the end of the day, or the beginning of the day, tending to the tasks that need to be done. They do them with such care, these routine and necessary tasks. They feel monk-like to me, their soft tread around these special places that are built for only one task. The task of funeral. And this is why they are special, they contain us, and our loved ones, as we make the final goodbye, and all the emotions that come with that. They hold us, and we then turn again to life. Today I am happy to be the person who helps these three families through this most sacred of transitions. It’s not very often I take three services in one day – but it happens. But that’s OK, most of the work for a funeral is done before it is delivered, in fact a good celebrant will spend around ten hours on each funeral in total. It is a task that requires a lot of attention and time that I am happy to give. It’s time now for my working day to come to an end. Then I am very grateful for the M57, as it’s the quickest way home for me. Driving around today I’ve been really conscious of the verges with blackthorn blossom, the fresh green of hawthorn. It’s happening… spring. Blossom is everywhere. Lovely. I’m listening to Judy Collins on the way home. Easy Times. A long day, a good day. An ‘I wouldn’t want to be doing anything else’ day. I am so happy, as after a car accident involving a lorry (not my fault) last summer I was unable to drive for five months. I thought that these sorts of days wouldn’t be possible anymore. But they are, and I am glad. I arrive home, and a lovely bunch of flowers has been delivered for me. It is from a family whose funeral I took a couple of weeks ago, and this is their way of thanking me. I am humbled and very touched. Thank you to everyone who entrusts me with this special and sacred task of funeral ritual. And for making my working days so enriched and deep and special. I feel so very lucky. This entry was posted in monkey puzzle and tagged Liverpool, monkey puzzle trees. Bookmark the permalink.